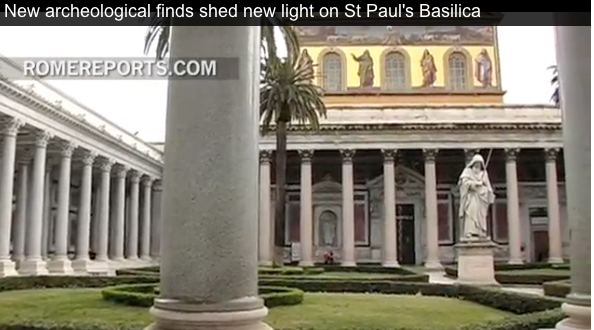 (Rome reports.com) TheBasilica of Saint Paul is one of Rome’s four major Churches. It was founded by emperor Constantine over the tomb of apostle Paul, which centuries ago, stood far from Rome’s walls. That’s why it is also known as Saint Paul Outside the Walls. For the first time, the Vatican has announced the discovery of several archeological sites that were associated with the Basilica’s daily life in the Middle Ages. Even though the route through the site is still provisional, visitors can already tour the area and read about the history of the site. During its 1500 year-long history, the Basilica’s architecture has changed immensely, even though the original shrine containing St. Paul’s remains still lies under the high altar. Around the year 1000 AD the basilica and its lands were entrusted to Benedictine monks, who still reside there to this day. Among the discoveries are the ancient ‘garden of the monks’ and medieval pilgrim facilities, which were unveiled in an official conference attended by the archeologists. The archeological finds in the area, include courtyards, a well and porches, which were all meant host the pilgrims that would visit St. Paul’s from all over the world. In a way, the structures show that the deep devotion St. Paul, never ceased through the ages. As part of the tour, drawings and reconstructions are available, to show how the area looked in ancient times. The distinguished team of papal biographer George Weigel, his photographer-son Stephen (who handles the illustrations), and well-known art and architecture historian, professor, author, and tour guide resident in Rome Elizabeth Lev have collaborated to produce The Station Churches of Rome (published by Basic Books, 400 pages with dozens of color illustrations). At first glance this work might be dismissed as yet another expensive coffee table book, but it is much more. Indeed it could variously be classified under the headings of Church history, architecture, archaeology, liturgy, art, tour guide, or spiritual reading. Let’s just say that this is a magnificent book about religion and in particular about a religious practice—pilgrimage—that predates both Rome and Christianity. In particular, the book chronicles an ancient Roman pilgrimage to the Station Churches during the connected liturgical Seasons of Lent and Easter. Christians adopted the practice of pilgrimage from their spiritual forbears, the ancient Israelites, when Christianity ceased to be a persecuted Church of the catacombs after Constantine’s Edict of Milan brought her out from illegality and persecution. This particular pilgrimage has experienced a revival in recent years, particularly with the beginning of the new millennium in 2000 that was so gloriously celebrated in the lands of Christianity and especially in Rome. The timing argues that at least part of the credit should go to the influence of our newly canonized St. John Paul the II, who was surely the greatest pilgrim in history. His frequent flyer miles alone would have brought him to heaven regardless of his sanctity.